In Major Shift, Boy Scouts Says It Will Begin Allowing Girls To Join : The Two-Way The Boy Scouts of America says that girls can join its Cub Scout program beginning next year and that it hopes to have a program in place for older girls in 2019. 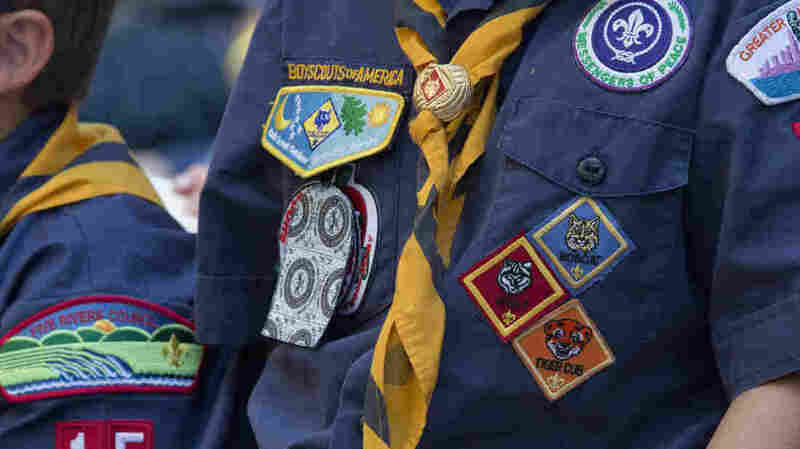 The Boy Scouts of America announced Wednesday that it will begin welcoming girls into its programs "after years of receiving requests from families and girls." In a move that shakes up more than a century of tradition, the Boy Scouts of America announced Wednesday that starting next year, it will welcome girls into some Scouting programs. The BSA said in a statement on its site that girls can join its Cub Scouts program starting in 2018. It will be up to existing packs to decide whether they will remain all-boys, go co-ed or create all-girl divisions. Cub Scout dens, which are smaller units of six to eight kids within packs, will remain single-gender. As for older girls, the organization says it will announce a program next year that will enable them to earn the highest rank of Eagle Scout. It hopes to have the program in place in 2019. "This unique approach allows the organization to maintain the integrity of the single gender model while also meeting the needs of today's families," BSA said. The decision comes after years of requests from families, the organization said. "Most are dual-earners and there are more single-parent households than ever before, making convenient programs that serve the whole family more appealing." It added that the move is also geared toward Hispanic and Asian communities, which are "currently underserved" and "prefer to participate in activities as a family." The Boy Scouts serves more than 2 million young people, according to last year's annual report. The organization has moved to become more inclusive, after years of declining membership — announcing in 2013 that it would admit openly gay youths and ending a blanket ban on gay leaders in 2015. Earlier this year, the group announced it would admit transgender boys. As The Two-Way reported in August, the Boy Scouts had for months been "exploring the benefits of bringing Scouting to every member of the family — boys and girls," according to spokeswoman Effie Delimarkos. That didn't sit well with the Girl Scouts of the USA, whose leadership accused the Boy Scouts of running a "covert campaign to recruit girls." In a scathing letter published by BuzzFeed News at the time, Girl Scouts National Board President Kathy Hopinkah Hannan called the Boy Scouts' plan unsettling and said it would only serve to undercut the Girl Scouts. She added that a co-ed model goes against "research supporting single gender programming." The Girl Scouts did not immediately respond to a request for comment following the Boy Scouts' decision Wednesday. The Boy Scouts already has certain co-ed programs in place, including Venturers and Sea Scouts, both billed as character-building programs, and Exploring, which focuses on career building. The announcement about welcoming girls came on the International Day of the Girl, which the U.N. says, "aims to highlight and address the needs and challenges girls face, while promoting girls' empowerment and the fulfillment of their human rights."